Since I can’t afford to drink a single malt every day (or nearly every day as moderation dictates), I’ve been looking for something to usurp the place of Johnnie Walker Black and Bushmills Black at my house. Those are both respected and popular blends, and they have enough complexity and refinement to provide a nice grown-up reward after a hard day. As blends, both contain grain alcohol to dilute the single malt component. In the case of Johnnie Walker, the distiller claims a mix of 40 single malts, and the best information I have (here) is that there is about 23% grain whisky in the mix. With forty individual malts in JWB, the character will be diluted, if predictable. And that describes JWB: predictable. It used to be my go-to dram for the average day, but at its price point (about $40 US where I live), it’s a bit pricey for a daily dram. Bushmills Black is another very good whisky with a cleaner, spicier taste which the wife prefers. There are some decent single malts near that price — even some aged as long as JWB (12 years). Thus, I’ve been looking for a Scotch whose price falls in between JWB and the range of blends like Johnnie Walker Red, Teachers (about 45% single malts), and Black Grouse — reasonably good and reasonably priced blends. And thus we come to Monkey Shoulder. This Scotch is a blend. But it’s a bit special. 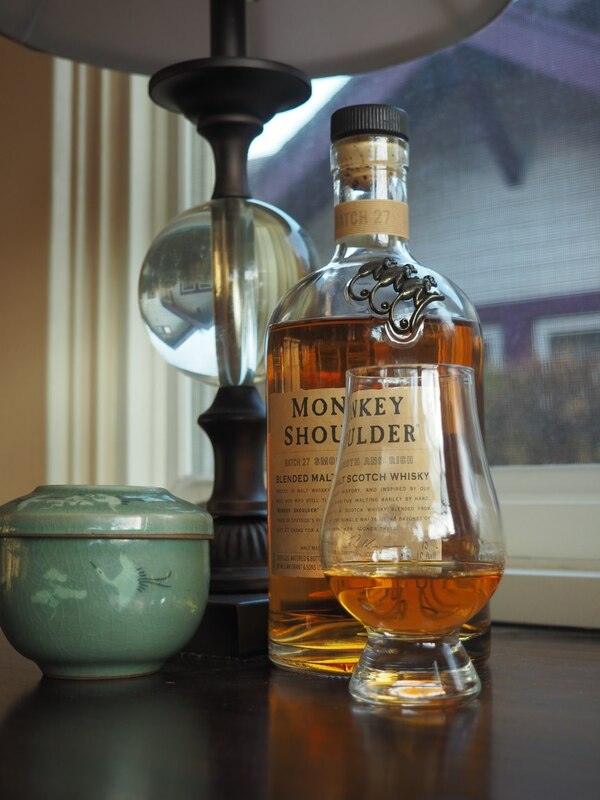 In the old days, they would have called Monkey Shoulder a vatted malt — a mix of single malts, no grain alcohol added. That William Grant & Sons have produced a vatted malt priced ($32 locally) well below the blacks from both Johnnie Walker and Bushmills is pretty amazing. One wonders how they do it. To determine that, we’ll have to investigate what is in the Monkey Shoulder blend. That’s only two single malts — but that’s just the malts Grant sells as single malt. Not all distilleries’ output is sold that way, the single malt being a relatively new (20th century) invention. A clue to Grant’s sources for Monkey Shoulder is found on the Grant website: “Grant’s owns a number of malt and grain whisky distilleries in Scotland.” So we can assume there are distilleries in the Grant family making malt whisky which is not being sold as a single malt, but included in the Monkey and other blends (the firm’s Grant’s Family Reserve line has 25 malts blended). They may even buy some malts from other distillers. Our investigation is stymied here. I’m willing to bet spirit from the Balvenie finds its way into Monkey Shoulder, perhaps with Glenfiddich and a third unbranded malt. And then it is aged — for a time, anyway. Scottish law requires three years. And that is how Grant can sell this whisky, which has a higher single-malt content than JWB, for less. They undoubtedly use younger whiskies than Johnnie’s Black (aged 12 years). Most likely, the Monkey Shoulder whiskies are comparable to Johnnie Walker Red (also no age statement), a dram with a far lower malt content. Being midway in price between the two Johnnie Walkers, Monkey Shoulder gives the Scotch drinker an opportunity to drink an all-malt beverage, where the young whiskies are tempered by careful matching of the spirit, yet focused enough that the individual characters of those spirits can come thorough. We can’t expect as much character from age nor oak as we’d see in an older whisky. So, we know (mostly) what it is. How does it taste? Grant claims Monkey Shoulder is “smooth and rich,” and I would agree. It is smooth, but not entirely without character. Visually, it has a medium amber color that indicates the use of ‘e150’ caramel coloring. I am not offended by that considering the price point, neither am I impressed. I don’t know of any Scotch that is naturally that color and I think it is overdone. Nose: Green pepper and aromatic oils — juniper perhaps, or eucalyptus. Reminds me of the stuff my mom put on my chest when I was sick long ago. Not a bad thing, it is subtle and gives it some character. Some vanilla and earth. I am pleased not to get any sting from raw alcohol here, even though it is a 43% blend. Palate: Here is the rich and smooth part. English toffee and vanilla yields a full mid-palate with a touch of oak to balance it and a luxurious mouthfeel. On the sweet side, but not obnoxiously so. A well-balanced treatment. Finish: We have well-toasted caramel, while touch of oak tannin dries to a clean finish. Bottom line: Monkey Shoulder avoids the bitterness you find in some young whiskies. I feel its strength is in avoiding the pitfalls of other moderately-priced Scotches (bitterness, one-note overwhelming the others, or a thin taste profile). It is not much for complexity, though the nose is nice. In the end, Johnnie Walker Black has more character but that is due to its age and the touch of smoke it gets from its Islay component. That is something a pure Speyside blend cannot match. But for the price point, if you like an unpeated and mellow whisky, this is a respectable step above Johnnie’s Red or Teachers, and is smoother and more balanced than some 8- and 10-year old single malts that you’ll soon be reading about on this blog. It is going into the rotation at my house. This entry was posted in Scotch-blends, Whisky and tagged Monkey Shoulder, Scotch, Whisky. Bookmark the permalink. We at Whisky Waffle love a bit of the Monkey Shoulder! One of the best blends (or vatted malts!) out there. We love starting the evening with a dram of this before proceeding to a single malt or two (or four). The third malt is the Kininvie, a distillery who have just started producing a single malt. Rich from William Grant and Sons tells me it is a fantastic drop, though I don’t expect to find a bottle any time soon. Great review, very interesting. We’ll have to get onto this one, one day. We did do the Johnnie Walker range, though in a light hearted and tongue in cheek way. (exhibit A: http://whiskywaffle.com/2014/11/17/johnnie-walker-red-label/) You’ll have to check the articles out some time! Hi Nick, thanks for the kind words and filling in the blanks for me on the ‘Shoulder. You are truly a malt master 🙂 I have a Vanishing Point kind of day coming up but will look forward to winding down with a bit of Waffling about in your Johnnie Walker reviews.